Day of rest. Went to church. Had a lesson on fasting in Sunday school, then another lesson in the Elder's quorum on Elder Uchdorf's talk in the Priesthood session about reaching your potential. Then talks on reverence in the Sacrament meeting. Went with the missionaries to a missionary discussion in the evening. They were reaching a 9 year old boy and his mom. She just got out of the battered women shelter into a house. The discussion was on the Word of Wisdom, part of which is staying away from alcohol. The boy told about his experience witnessing his dad's DUI arrest. A.M. Did my strength test again. See how long I can hold 5:20 without having to sprint. So I did 79, 80, 80, 82 (5:21). Not good. Jogged some, decided to try again to see if the failure comes sooner. 80, 80,80, 80 (5:20), 83, 82 (8:05 for 1.5). Hmm... That is the oddest pattern. How does that work? You would expect that after getting to the point of not being able to run another 80s quarter without a significant effort I would not be able to return to the same condition after only 10 minutes of jogging. A possible explanation is that my slow twitch fibers cannot go faster than 5:30. So if I want to run 5:20 I have to recruit fast twitch, and they fatigue after about a mile. Fast twitch recover pretty fast, and are ready to go again after 10 minutes of jogging. Slow twitch are not fatigued, in the meantime, they just cannot go fast enough. The feeling is also rather odd. At 80 the stride feels relaxed, like I am only recruiting a fraction of power. Then when I slow down, all of a sudden it feels like I am recruiting every fiber there is to recruit, like I am trying to squat with maximum weight. That does go along with the fast twitch fatigue explanation. It takes only a fraction of fast twitch power to run 5:20 pace. But it does take all of the slow twitch power to run 5:30 if the fast twitch are not helping. Ran with the kids Benjamin did 4, Jenny did 3, Julia and Joseph did 1.5. A.M. Decided to run a little less today. Here is the theory behind it. There are three important factors to be aware of when trying determine the optimum length of the run. Aerobic stimulus, fatigue hormones, and strength hormones. Aerobic stimulus increases in proportion to the length of the run. 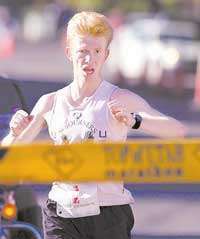 The fatigue hormones increase in proportion to the length of the run as well. If the fatigue hormones overpower the strength hormones, you may get stronger cardiovascularly, but it does you no good because the muscles are too weak to use the aerobic power. The tricky question is at what point the fatigue hormones begin to overpower the strength hormones. I am suspecting this critical point varies not only from individual to individual (obviously), but also within the same individual based on his level of strength at any given time. So if the strength hormones are doing well, you can throw a few more miles at the body, and you will do fine. If not, they get overpowered. I did notice over the last month that running only 8-10 miles in one run compared to the normal 12.5 correlated with the increase in strength, and then returning to 12.5 gave me a decrease again.This was rather odd, I thought, because in the past I did not notice any such difference. In fact, in 2007 I ran 13 miles in one run followed by another run in the evening with no loss of strength. So I thought if anything, I would only get a reduction in the aerobic power from running only 10 instead of 12.5. But solutions are often found by exploring odd possibilities. A good rule of thumb is that a solution to a difficult problem often involves an odd move. If it did not, you would have seen it already, and the problem would not be difficult. So I decided to see if that was a coincidence, and ran a bit less today - 10.25 including kids runs. Benjamin did 4, Jenny, Julia, and Joseph 1.5. I did a couple of pickups on the trail just for fun. A.M. Repeated my 5:20 pace test. This doubles as a workout, but I am more interested in using it to see if how my naps, magic foods and herbs, mileage variations, and other forms of magic affect the muscular performance. So here is what happened: 79, 78, seeing the pace was drifting upward I eased off, 82 too much, but now I could not quite get it back up, 81 (5:20), then I said if the next quarter is slower than 81 I am going to 1.5 otherwise full 2, 81, 82, 82, 80 - 10:45.4 for 2 miles, which is the fastest time and the best split (5:20, 5:25) since I started doing those tests. So apparently I did something right between Monday and today. Will try another 2 days of 10 miles instead of 12.5, and see what happens on Saturday. Ran with the kids. Benjamin did 4, Jenny 2, Julia 1.5, Joseph 1. Total of 15 miles. A.M. Easy 10. Ran with the kids - Benjamin 4, Jenny 3, Julia and Joseph 1.5. A.M. 10 total, including runs with the kids. Benjamin did 4, Jenny 3, Julia and Joseph 1.5. A.M. It was a crazy day today. We had a baptism in our ward this morning which I was in charge of, the kids were performing in an Independence Day celebration, and we went to Ben Crozier's wedding. He finally found a young lady that saved him from being a menace to society. And yesterday was rather crazy as well as we went to a Russian missionary reunion. So anyway, I was not expecting much from today's workout, but it went quite well. I did 15 miles with a 2 mile time trial. It went like this: 80,80,80,80 (5:20),82,81,83, 77.5 (5:23 high). Total time 10:43.9, which is the fastest I've done on those time trials so far. Still not where I should be, but at least some progress.